In the Age of Giorgione, currently on exhibition at the Royal Academy of Arts in London, has attracted a lot of attention in the British press. Questions of interpretation and attribution have inevitably arisen, and some critics have complained that Giorgione is hardly represented. The curators of the exhibition admit that “complex questions of attribution” have always surrounded Giorgione and his work, but argue that the current exhibition is really an attempt to explore Giorgione’s world by featuring the works of a kind of brotherhood of artists working in Venice in the first decade of the sixteenth century. In the Age of Giorgione brings together works by a number of artists who lived in Venice at the time: Giovanni Bellini, Giorgione, Titian, Sebastiano del Piombo, Lorenzo Lotto and less well-known figures such as Giovanni Carianni among others. Through a consideration of the city’s artistic context at the turn of the century, this exhibition explores Giorgione’s visual identity in depth, examining how his significant contribution helped shaped the exciting new generation of artists. Questions of attribution are of great importance not only to art historians, dealers, and collectors, but also to the general public. Museumgoers will flock to see a genuine Raphael, but will show little interest in a similar Madonna by some member of Raphael’s studio. However, I would like to argue that interpretation of paintings matters more that attribution when it comes to understanding the age of Giorgione. A good example can be found in a small pamphlet, “Exhibition in Focus,” that the Royal Academy has produced for visitors. The exhibition has been divided into four sections: Portraits, Landscape, Devotional Works, and Allegorical Portraits. In the Allegorical Portrait section, devoted to “portraits of individuals depicted in mythological or religious guises,” the curators discussed Cariani’s Judith, and Giorgione’s La Vecchia. They also believed that Giorgione’s Three Ages of Man, which apparently had not arrived from the Pitti Palace in time for the opening of the exhibition, was an allegorical portrait representing the passage of time in its depiction of three men of different ages. 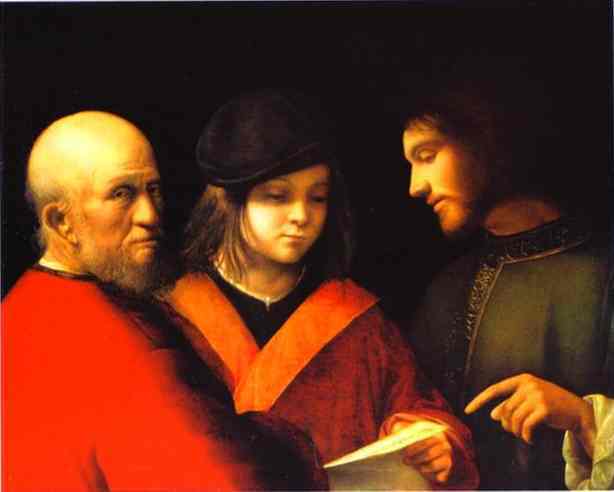 His Three Ages of Man, c. 1500, depicts a youthful boy flanked by a grown man and an older gentleman. The older man is looking over his shoulder at us, thereby establishing a direct connection with viewers. The painting is generally interpreted as an allegory of the three stages of life: boyhood, adulthood and old age. Like the old woman in La Vecchia, whose gaze gives that painting a startling immediacy, the three men depicted in this painting communicate its message with brutal honesty. Nevertheless, I have argued that the Three Ages of Man is as much a devotional work as Titian’s Christ and the Adulteress, and as such provides great insight into the world of Giorgione and his contemporaries. Although it is usually called the Three Ages of Man because of the obvious disparity in the ages of the men, scholars disagree on the subject or meaning of this painting. Today, most reject the three ages label. Some call it a “music lesson” while others prefer to see it as the education of a figure from antiquity like Marcus Aurelius. But, once it is pointed out, I believe that any ordinary person would be able to see that it is a depiction of the encounter of Jesus with the rich young man from the nineteenth chapter of the gospel of St. Matthew. Here is an excerpt from my paper that can be found at my site, MyGiorgione. How has Giorgione depicted this story and who is the third man? The most spectacular elements in this mysterious painting are the colors of the garments of the three men. Nothing in a Renaissance painting is there by accident or whim. The colors in this painting provide a major clue to its real subject. The man in the middle is obviously young and the golden lapels of his garment as well as his fashionable hat indicate that he is well to do. He is holding a piece of paper or parchment that contains some indecipherable writing. On the right, despite the inability of art historians to see, any Christian, Venetian or otherwise, would immediately recognize the visage of Jesus. There is no halo or nimbus but Giorgione never employed that device. The pointed finger is certainly characteristic of Jesus. Here he points at the Commandments, which the gospel passage has just enumerated. Jesus wears a green garment or vestment, certainly an unusual color for him. In fact, it looks like the robe or chasuble worn by a priest during Mass. At the hand of Jesus we can also see the white sleeve of the “alb,” a long white robe always worn under the chasuble. Green is the color used by the Catholic Church during Ordinary time, that part of the Church year not identified with any of the great feasts. The third man is St. Peter. He is the only other person identified in Matthew’s account of this incident. He stands on the left, head turned toward the viewer. Giorgione uses Peter as an interlocutor, a well-known Renaissance artistic device designed to draw the viewer into the painting and encourage emotional participation. The old man’s face is the traditional iconographical rendering of Peter with his baldhead and short stubby beard. Artists often portrayed Peter as a robust old man, with a broad forehead, and coarse features. Nevertheless, some young Venetian patricians were wondering whether the whole life of politics, commercial rivalry, and warfare was worthwhile. One of them, Tommaso Giustiniani, a scion of one of the greatest families, did actually sell all his possessions, including his art collection, in order to live as a hermit in a Camaldolensian monastery. He had come to believe that Venetian life was agitated, completely outward, and continually dominated by ambition. 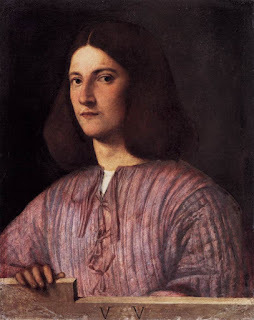 Tommaso Giustiniani and other rich young men like him could have been patrons and even friends of Giorgione and Titian in the first decade of the sixteenth century. The Encounter of Jesus with the Rich Young Man, the name we can now give to the painting, is a window into their age. I like to think that another painting featured in the Royal Academy exhibition might portray Tommaso Giustiniani. It is the Giustiniani Portrait, a portrait of a young man who has become the poster boy for the whole exhibition. I know that it is impossible to prove a connection, but the painting was originally in the possession of a branch of the Giustinani family, one of the great Venetian Patrician families.